We’ve had another great year here at Coller Industries. 2016 brought a few changes, but they were all needed, and we have benefited from them greatly! We have also seen more growth to our inventory. Not only does this increase mean more options for our customers, but it means strength to our brand. We released three new products this year to meet the requests and needs of our customers. These new name tags are a perfect solution for any meeting planner’s need for inexpensive name badges. Instead of spending your time printing inserts and stuffing vinyl name badge holders (which are still available), we print your attendees’ names on custom laminated tags. 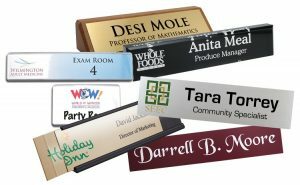 These name plates are the perfect solution for desks, cubicles, front counters and reception areas to provide instructions and identification. They are made from quality eco-friendly materials and are a cost-effective solution. The plates are easy to customize in any office. Just print a paper insert and assemble the professional looking name plate. The partition pins easily hang a name plate from a cloth covered cubicle wall. 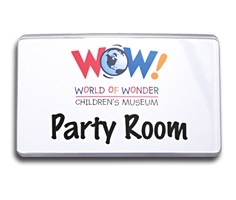 Just attach to the back of any name plate or sign for easy visibility. As with previous years, we have also seen growth inside of our company. We have a new Customer Service Manger and a Senior Account Manager. Hannah and Aimee (respectively) are here to serve our customer’s every need. Of course, we still have the best customer service around to help anyone with their personal identification needs. Due to some of our new products, our production and shipping department has seen an increase in our machinery. This includes a laminator as well as a new, fancy printer for our name tags. 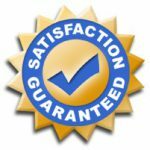 Production and shipping also do a fantastic job with making sure all customer orders are produced and shipped appropriately and promptly. Since January 1, 2016, Coller Industries has had a total of 122 errors coming from 31,694 orders total. Our overall error rate is 0.393%. This means that 1 in about every 255 orders may contain a mistake; great news for our customers! Coller Industries would like to thank all of our wonderful customers for an outstanding year! You are the reason we are in business, and we want to acknowledge that. And with that thank you, we also wish you a wonderful and happy New Year! 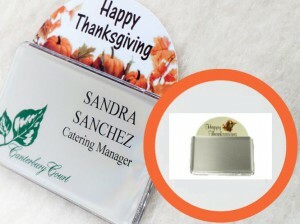 Thanksgiving, name tags and the best customers! Thanksgiving is so close that we can smell the turkey in the oven! Families will soon gather in dining rooms across this great nation. And thankfulness is found everywhere. Celebrating Thanksgiving allows us to focus on our blessings, giving thanks for what we have, and for the freedoms which we all enjoy. We here at Coller Industries Incorporated just wanted to take the time to say Happy Thanksgiving and give thanks to all of our customers, new and old, that have supported our business over the past year. Thank you for stopping by, leaving a comment, and shopping our large name tag selection. We are blessed to be part of your personalized identification needs. To help celebrate the Thanksgiving occasion, here’s our list of things for which what we are thankful. Great impressions at conferences and meetings are a must! And with event name tags, networking is easy and affordable. 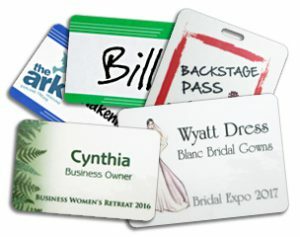 Style and ease are a must with reusable name badges and speedy badges accomplish just that! Contemporary name plates are easy to use and are the perfect solution for providing employee identification for desks, cubicles and offices! Finding people who adore personal identification as much as we do! We appreciate all of our customers who ask all the right questions. Thank you for your continued encouragement and suggestions. All of our new customers which we gained this year! Thank you for placing your trust in us and our products. We love all of our repeat customers. Loyalty sits well with us! And most of all YOU! We appreciate your friendship, business and the confidence you have placed in us. So, on behalf of all of us at Coller Industries Incorporated, our best wishes for a Happy Thanksgiving. WE’RE THANKFUL FOR NAME TAGS! Posted on November 22, 2016 May 21, 2018 Author Alisha CopferCategories Events and Holidays, Our ProductsTags contemporary name plates, customer appreciation, event name tags, reusable name badges, reusable name plates, speedy badges, thanksgivingLeave a comment on Thanksgiving, name tags and the best customers! Most people think of name plates as simple plastic or metal pieces with their name and maybe title on it that are displayed on a desk or a door for others to see. Whether it’s name tags, name plates or any other personal identification, here at Coller Industries we are always trying to keep up to date on our customer’s needs and possibly want lists. Part of this process is to also keep up with the trends in the personalized identification business. And, any corporate branding initiative should begin within your own office. New products are always an exciting time here in our office! This new name plate style incorporates the identification into a new, updated and sleek look while still providing a professional feel. Our new contemporary name plates are the perfect solution for desks, walls, doors, cubicles, counters and reception areas. 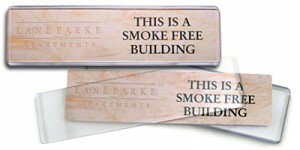 They are a highly effective way to present room names, department titles or employees names. Use on front counters, waiting rooms and reception areas to provide instructions and directions. Hang on a wall or display on a desk for employee identification. Each name plate is made from quality, eco-friendly materials and they are a cost-effective solution to your personal identification needs. The shatterproof polycarbonate components make for a long-lasting and reusable solution. The plates are easy to customize to match any setting. 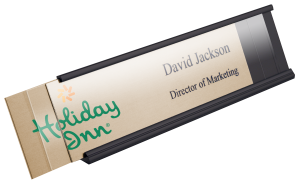 Simply print on a paper insert using an inkjet or laser printer and easily assemble the professional name plate. All of the parts snap together in seconds, with no tools required. Create your own design with any color, logo and font you want; if it prints, it fits. 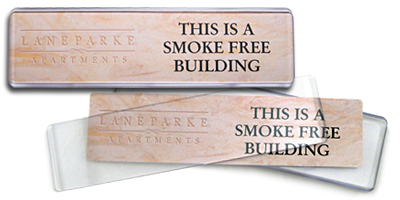 The contemporary name plates are available in three convenient sizes. Interchangeable attachments are available allowing these plates to be set on desks, hung on walls or doors, and cubicle partitions for easy display on cubicle walls. 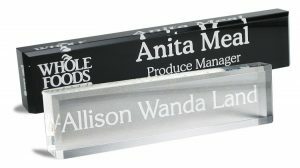 When there is a change in a position or adding a new employee, the name plates can be quickly replaced by printing a new insert. 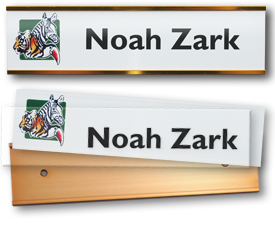 Our new contemporary name plates are designed to reduce time and expense for offices and stores while providing an updated look for brand awareness and consistency.